At a remote location deep in Western Australia’s Gibson Desert are two massive ironstone blocks, upon which are several carved human figures 1.8m in length and clothed in strange garments. There are also heart-shaped face carvings bearing ‘happy’ and ‘sad’ expressions similar to other rock engravings found over a wide area of Central Australia, South Australia and Far Western NSW, which have included nearby discoveries of human figures depicted in armour and helmet-like garments up to 1.2m tall dated back to 20,000 years old. The Gibson Desert engraved ironstone blocks also bear deep channels, caused by ages of exposure to rain water. In this same desert region ancient megalithic stone arrangements, circles and alignments occur, all displaying deep channels carved by excessive rainfalls. explaining the materials needed to construct these. Photo © Rex Gilroy 2004. Yet this parched landscape has not experienced regular rainfalls since the Ice-Age pasturelands hereabouts dried up at least 30,000 years ago! In the Adelaide Hills, South Australia, the fossilised sandalled foot impressions of an adult and child were discovered in a mudstone shoal many years ago. The impressions suggested well-made leather sandals unknown to the primitive Aborigines. These fossils were dated at least 10,000 years old. Many other ancient rock engravings of non-Aboriginal origin can be found at widely-scattered inland locations throughout Australia, depicting human figures, both male and female, clothed in apparent well-made garments; coats, trousers, long sleeved robe-like garments with buttons, clasps and belts, head dresses and boots, many dating back anywhere between 30,000 to 50,000 years. And at a Hunter Valley location deep inland from Newcastle, NSW there stand three huge menhirs [standing stones] 7.6m above the ground, extending below surface for about 18.3m! Each of these massive stones are placed close together on an east-west axis and are alien to the area. One is of ironstone, the second is granite and the third a type of slate. They are flattish, weighing 2 tons to a cubic yard! Researchers have found that the stones, which are in alignment with a lengthy row of monoliths erected nearby, act as a kind of stone-age electrical battery, storing and releasing an often strong current of natural earth electricity which flows back and forth along the nearby alignment. Great numbers of workers would have been needed to drag and erect the 26m length monoliths [working to a pre-arranged plan], which they had removed from great distances from the site; a mammoth task thought to have been carried out over 20,000 years ago. Also, at Fugal on the coast of the NSW side of the Queensland border, a buried stone ‘wall’ constructed of massive blocks was uncovered by locals many years ago below ground near the shoreline, and which skin divers later found continued on submerged far out beneath the ocean for some distance. The ‘wall’ is said to be about 21.3m wide and about 18.3m high. The massive structure, say skindivers, resembles and ancient stone wharf. The stones fit so close together that a knife blade cannot be inserted between them. What do the foregoing discoveries tell us? They demonstrate that, by 30,000 and 20,000 years ago, a highly advanced Stone-Age “super-civilisation” ruled Australia. In each case local Aborigines describe them as traces of a mysterious race of pale-skinned [ie white] “culture-heroes” [gods] who ruled the continent in the long-ago ‘Dreamtime’. 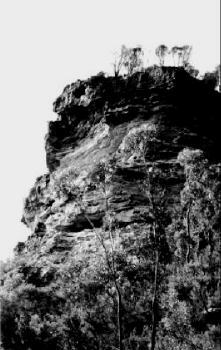 And at one Uru rock inscription site near Katoomba NSW, the author discovered a number of ancient glyphs inscribed upon a strata of red slate at the base of a sandstone-ironstone slope near a cliff edge. However, what really interested me was that this 8cm thick slate rock, having broken away on the edge, had exposed other, far more ancient glyphs, cut into the sandstone shoal beneath, and which appeared to continue on under the overlaying red slate. The script engraved upon the slate rock is at least several thousand years old; but how old is the inscription beneath? Australia is a land of unsurpassed mysteries of ancient human history, [and it is certain], of the very beginnings of world civilistation in the form of the mighty Uru. Although a Stone-Age people they had received a ‘kick start’, triggered off it seems certain, by a fascination with the movements of the heavenly bodies, which struck the divine spark that illuminated mankind. It led them to develop an astronomical science which aided their agricultural endeavours as well as maritime navigation; yet it was only one aspect of their advanced stone-age scientific achievements, and that is what this chapter is concerned with. 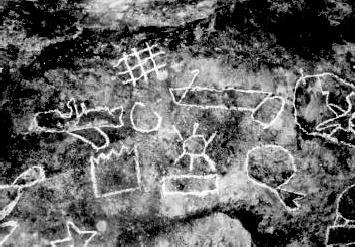 Of course, due to the lack of written records made upon perishable materials, we must rely solely upon what information we can deduce from their rock inscriptions, for the scant information so far gathered on this remarkable people. settings of the stars and planets, but also in the plotting of the risings and settings of the Sun on the Summer and Winter Solstices [22nd December and 22nd June respectively in Australia]. By their observations they discovered the sphericity of the earth at an early period in their megalithic activities. Yet the methods by which they moved these stones, sometimes weighing hundreds of tonnes, continues to elude us. Wooden rollers? mathematical knowledge which has yet to be fully understood, as were their units of measurement, particularly concerning alignments extending over long distances. A small stone slab recently unearthed at a Katoomba NSW astronomical site bears small fine engraved lines marking out degrees. The Uruan megalithic astronomer-builders certainly worked from surveyed plans written upon perishable materials, such as animal hide, or even a papyrus-type paper similar to that of the later Egyptians. They certainly surveyed sites prior to the erection of temples, tombs and other structures, as demonstrated by many accurately placed stones forming megalithic monuments across Australia. This is also to be seen in the “serpent paths”, or Ley Lines that the Uru established, and which extend across country for perhaps hundreds of kilometres, and which follow both man-made sites, ancient tracks, hill and mountain peaks. While Uruan ‘Birdpeople’ were strapping crude hang gliders to their backs and leaping from clifftops, other, more foreward thinking men were apparently creating an even more advanced aeronautical technology… Weathered rock engravings near Katoomba, found by the author in June 2003, in the vicinity of “Birdman” images, describe craft which appear to be more than one type of ancient hot-air balloon, as well as apparent gliders and other mystery objects. If these petroglyphs, thousands of years old, are what they appear to be, adventurous Uruans in mighty airships once cruised Australian skies. It does not seem impossible that Uruan thinkers, watching burnt leaves etc rising with the heat from a fire, could have come by the idea of trapping that hot air, perhaps at first in an experimental light-weight receptacle, such as perhaps a small bag made of papyrus-type paper, then later in a far larger, passenger-carrying balloon-type craft. However, a passenger-carrying balloon is a far cry from a small paper bag, and would have required a great deal of planning and experimentation before the first test flight could have been attempted. Perhaps thinly tanned animal hide was sewn together with twine and sealed with tree gum before being stretched over a framework of lightweight saplings, with an opening wide enough to allow the hot air from a fire in a gondola beneath to enter the balloon. A small opening on the top of the balloon opened and closed by a flap worked by a cord from the gondola would have been necessary to avoid condensation from forming inside the balloon. The gondola would have had to have been made of lightweight interlaced saplings and a stone fireplace located beneath, with a wood supply kept burning to provide a continuous flow of hot air into the hole above to keep the balloon airborne. A crew of at least two men would have been needed, and to overcome the unavoidable weight of the balloon material, fireplace, wood supply and its crew, a balloon of considerable size would have been necessary. It is likely that until the balloon was sufficiently filled with hot air while on the ground, stakes were positioned to keep it from collapsing. At the end of a flight, in order to descend the crew could have kept the top flap open long enough to allow sufficient air to escape to allow a slow descent. Eventually, through trial and error a long, wide animal hide funnel could have been added to the hole beneath, which could be clamped shut after enough hot air had entered the balloon. 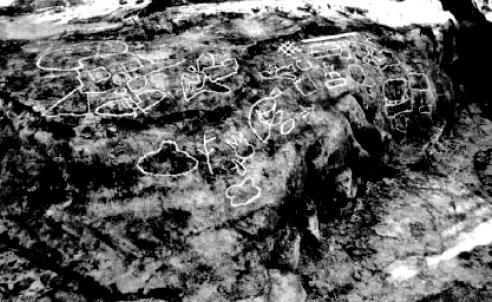 From a study of ancient rock art just mentioned it appears that the Uru gradually advanced this technology, with massive craft containing crews of from three to four individuals. The designs of apparent balloon craft described in the ancient petroglyphs include airships with builtin gondolas a door and windows, steered by a rudder and flaps. Other balloon craft are “flying saucer” in shape, and one particular petroglyph shows a downview of the circular craft with interior compartments. Beneath this image is another huge balloon model showing two human figures inside, a fireplace, outer flaps and large flap-like rudder at the end of the craft. Above a “flying saucer” type balloon a human figure is depicted, attached to a bag-like object. Did the Uru also invent a small balloon to lift an individual off the ground for purposes unknown? Other images in the Katoomba“balloon art” site show individuals apparently steering flying craft, one of these is “saucer shaped”, the other more balloon-like with a large ‘tail’ at the rear end, the ‘pilot’ being seated while he works controls. From a study of the engravings of these balloon craft displaying their side flaps and large rear rudder, I theorise the following: Like the rudder, the side flaps were large, each worked by an individual who turned the rudder from one side to the other, while the flaps were moved up or down [depending upon which direction the craft was to move], all of which were attached to long poles resting upon upright stakes with windlass handles at the end. sealed with tree gum, as are the flying vessels that glide. of the Sun, ships of saplings and air fly. They fly for Nim”. These engravings, over 15,000 years old, suggest the Uru were the first people to conquer the air. Yet how did they come by this advanced Stone Age technology, especially their“flying saucer” shaped balloon airships. Some may argue that this super race of the Australian Ice Age might have been influenced by extraterrestrial visitors; yet it is just as likely that the Uruan conquest of the air was a natural consequence of advances in their by then highly advanced stoneage science. In Chapter Eleven we have seen that hang gliders were used by the men and women of the Birdman Cult in ceremonial flights in honour of I-na the Eagle or Bird of the Sun. Flights were also enjoyed as a leisure pastime. In the development of these first hang gliders, Uruan thinkers would have made observations of birds in flight and studied their physical structure, which would have not only aided them in the development of the hang glider, but also in that of the aircraft-like gliders depicted in the Katoomba rock engravings. The invention of flying craft was THE great Uruan scientific achievement, for their development went far beyond ceremonial and recreational use, for it led to better communications between far-flung communities and kingdoms. Now trade goods could be flown rather than carried overland or sailed along river systems, and the length of flights over the land were only limited by the amount of wood on board, requiring occasional landings to gather more fuel. There can be no doubt that many experimental hang glider flights came to grief, and in the case of balloon flights particularly so, for without great care at all times these would have become fire traps. Balloon flights across Australian skies were one thing, but exploration over vast distances of ocean to other lands would have been greatly handicapped by the constant need for wood fuel; yet perhaps the Uru were able to overcome their problem with gigantic craft capable of carrying enough wood. Who can say what they may have accomplished in these matters. Island-hopping was not impossible, as balloon flights could have reached Tasmania, the Torres Strait Islands and New Guinea; from where flights could have carried these Uruan airmen into Island Melanesia, even perhaps as far as New Zealand and other islands in the Pacific, or northwards through South East Asia’s island chains. The sight of these huge airships descending from the sky would have remained long in the race memories of the islanders, and might explain many [but not all] traditions of‘Gods’ who once descended ‘from the heavens’ imparting culture and civilisation to their ancestors. mythology carried the Sun-God Nim, across the heavens each day.